The sky is the limit with our Mix & Match patterns. Why not add the Ileana collar and button placket to a basic A-line Louisa dress ? Creating a new look has never been so easy. You can mix & match the sleeves, collars, skirts and pockets of our kids dress & blouse patterns. Can you imagine the endless possibilities ? Below you can find more information on which pattern pieces are interchangeable. To inspire you we’ve created some examples on our website. Free tutorials included… Want some more inspiration? Check the mix & match category of our Sewing Contest 2015! Changing sleeves from one pattern to another is so easy. So why not experiment with a long sleeve Louisa dress for winter or a flutter sleeve Frederique for summer. We have 8 sleeves at the moment and many more will be added in the future. Pick your sleeve depending on the season, this way you can use our patterns whole year round. Lotta dress: this pattern comes with a cap sleeve or a regular sleeve opening. This way you can add sleeves from other patterns to the Lotta dress. Skirts are so easy to swap. That’s why you can choose to add the gathered skirt from the Lotta dress to the Ileana dress and vice versa . This way you can create your own look. A more frivolous style or a princess ‘spin’ dress: everything is possible! Collars are the finishing touch to a handmade dress. You can use one of the Ileana dress collars onto the Louisa dress pattern. This way you can create the ultimate vintage style dress. Skip for example the big pocket and add a faux button placket and collar. An easy change, with a completely new dress as a result! Ileana dress: round or rectangular peter pan collar, floral collar or a little bow. Louisa dress: the Louisa dress doesn’t include a collar but you can use the collars above on this pattern too. EXTRA: you can find an extra free collar on the tutorials page. As you know we love pockets. 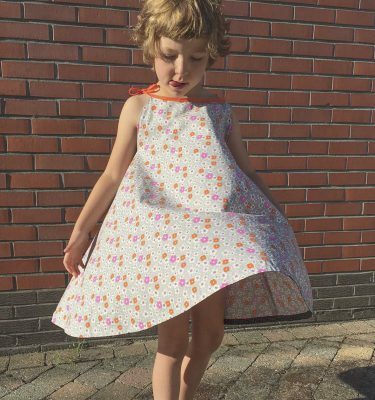 All our patterns include pockets and some of them are interchangeable. So play around with the pockets included in these patterns to create a new detail.